f0101 was designed by Veerle Pieters during Breast Cancer Awareness month with the default style especially for the ladies. Never fear though the beautifully illustrated figure can be changed to a male figure or removed completely. Packed full of widgetized goodness and slickly presenting your blog posts this theme is pure eye candy. 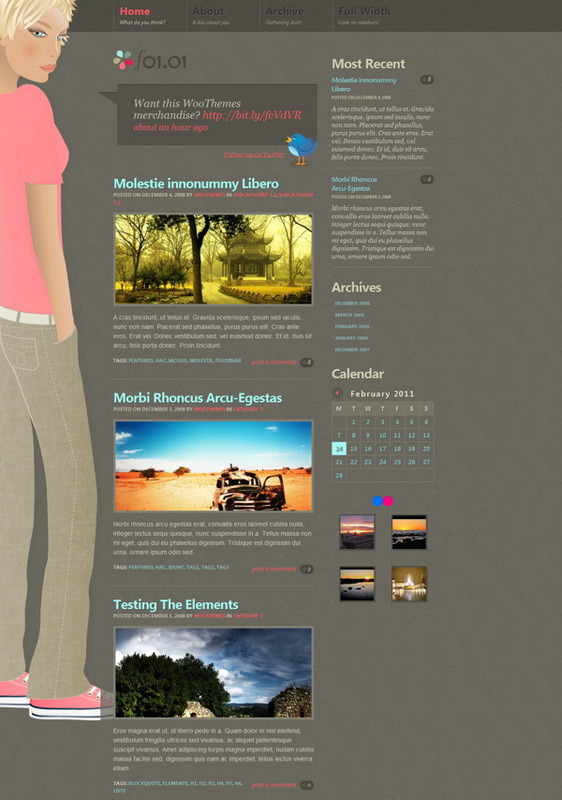 A beautifully illustrated male or female figure to the left of the website, that can be inter-changed, replaced or removed in the theme options panel. Complete control over excerpt vs content being displayed in the home pages blog posts, and archived posts. 12 custom widgets to have complete control over your sidebar and footer regions, packed full of loads of functionality including a social profiles widget highlighting all your online profiles. 10 delicious alternate color schemes to choose from, 5 male and 5 female. Making simple changes without editing code, like adding your own logo, changing to an alternate color style, adding Google Analytics code, couldn’t be easier with the back-end theme options panel. The theme is compatible with all the modern web browsers like Firefox, Safari, Chrome and Internet Explorer. There is an image resizer script built into the theme framework to automatically scales your post images for pixel perfect display in our templates. No need to upload new cropped images when re-designing your website. It comes packaged with a .po file for easy WordPress theme translations into your desired language – editing one neat little file without hunting down text in the theme templates.